This article is good. It can still be slightly improved, either by adding content, restructuring the page, or updating its content. There’s an obligation upon every household to have a candle lit for Shabbat. There is a discussion whether lighting Shabbat candles is part of the mitzvah of Kavod Shabbat or Oneg Shabbat. Either way, lighting Shabbat candles is a derabbanan mitzvah. 6 What should be used for candles? The minhag is that the husband of a woman who gave birth that week, lights Shabbat candles for his wife. A guest who comes to someone else's house for Shabbos and isn't eating meals at their host's house, if he has someone lighting for his at home, such as a wife or mother, if he has his own room, he should light in his room. If he doesn't have his own room, he is exempt from lighting. Some say that a yeshiva student whose mother is lighting Shabbat candles at home need not light Shabbat candles at Yeshiva as long as there is enough light in his room for his needs. Others, however, hold that a yeshiva student is obligated to light at yeshiva. According to those who say a yeshiva student is obligated to light in yeshiva, some say that one student should light in the cafeteria on everyone’s behalf and everyone else turns on a light in his room according to his needs without a bracha. Others argue that each student should light in his own room with a bracha. If a yeshiva student eats the Friday night meal at someone's house and not the cafeteria, according to those that he usually fulfills his obligation with the lighting in the cafeteria, this week he wouldn't fulfill his obligation with the lighting in the cafeteria, rather according to some one fulfills his obligation with the lighting of the family that he is eating at. According to Sephardim, he should light in his dorm with a bracha and make sure that it stays lit until he returns from the meal so that he can benefit from the candles. They should only have one person per room light. The halachot for a girl living in a dorm at seminary is the same as for a boy living in a dorm at yeshiva in regards to Hadlakat Neirot. What should be used for candles? ↑ Rambam (Shabbat 5:1) and S”A 263:2 rule that there’s an obligation to have a candle lit in the house for Shabbat. ↑ In one place the Rambam (Shabbat 5:1) writes that lighting Shabbat candles is considered Oneg Shabbat, whereas in another place (Rambam Shabbat 30:5) he states that it is included in Kavod Shabbat. ↑ Rav Ovadyah Yosef in Sh”t Yechave Daat 2:33 and Sh”t Yabia Omer O”C 2:16 holds that a woman should say the bracha of Hadlakat Neirot before lighting the candles and saying it afterwards is possibly a Bracha Levatala. Menuchat Ahava (Vol 1, 4:5) agrees. The Ohr Letzion (vol 2, 18:3), however, writes that a woman who has the practice to say it after lighting should continue her practice and a woman who doesn't have a practice should say the bracha before lighting. ↑ Rama 263:5 writes that the minhag was to light and then make the bracha while covering the flame so as not to benefit from the flame before making the bracha. Beiur Halacha s.v. Achar Hadlaka brings a dispute whether a man does the same process as a women or not. Shemirat Shabbat KeHilchata 43:30 rules that a man should first make the bracha and then light. ↑ The practice to pray for children that will be Torah scholars is based on the Gemara Shabbat 23b that says in reward for keeping Shabbat candles, one get children who lighten the world with their Torah. The Magen Avraham 263:11 in name of Rabbenu BeChay says that it is proper for a person to pray for children that will be Torah scholars when lighting the Shabbat candles. This brought as Halacha in Kaf HaChaim 263:1 and Menuchat Ahava (vol 1 4:3). ↑ implied for the language of Rambam (Shabbat 5:1) and S”A 263:2. ↑ S”A 263:1 rules that one should have two candles, one for Shamor and one for Zachor. ↑ Rav Hershel Schachter in a published pamphlet about Hilchot Shavuot (p. 3). Rav Yitzchak Yosef (Motzei Shabbat Vayigash 5779, min 35-38) explained that one should light with an electric bulb in one's private room and it can even be a LED or fluorescent bulb. He said that one can light in one's bathroom and once he saw his father do that when he was in a hotel for Shabbat. Or Letzion 2:18:13 assumes that one can't fulfill the mitzvah of Shabbat candles with electric lights and concludes therefore one can light Shabbat candles there even if the electric lights are on in that room. Other suggestions to support this approach include that of the Klosenberg Rebbe (cited by Radiance of Shabbos p. 20 n. 3) who says that it is still a recognizable honor to light candles for Shabbat more than it is to have electric lights. Rav Shlomo Zalman (Shemirat Shabbat KeHilchata ch. 43 n. 171) suggests a similar idea. Rav Moshe Feinstein (Igrot Moshe 5:20) suggests another possibility. Perhaps there's an obligation to light candles even though we have electric lights because maybe the electricity will go out. However, others hold that one must turn off the electric lights before lighting as is mentioned below. Rav Yitzchak Yosef (Motzei Shabbat Vayigash 5779 min 50-57) explained that one can light in a room with the electric lights already on but it is better to turn them off. He said that he never heard his father tell his mother to turn off the electric lights before lighting. ↑ Rashi (Shabbat 32a s.v. Hareni) writes in name of Beresheet Rabba that women are more obligated in lighting candles since they were involved in the sin of extinguishing the light of the world in the sin of Etz HaDaat. Rashi gives a second reason that the women are more obligated in this mitzvah is because they deal with the needs of the house. The S”A 263:3 and Rambam only gives that second reason of Rashi. This reason is brought by Mishna Brurah 263:12. ↑ S”A 263:3 brings this reasons and rules that the woman of the house is more obligated and so, if the man wants to lit, the women can prevent him. ↑ Mishna Brurah 263:11. Sh”t Tzitz Eliezer 15:32:7 writes that essentially the woman who gave birth can light but the minhag is not to. The Rambam (Shabbat 5:1) and S”A 263:2 write that men are obligated in the mitzvah of lighting Shabbat candles just like women. The Mordechai (Shabbat 294) quotes the Maharam, who says that a person who is going away from home for Shabbat must light in the place he is staying. If, however, a person is at home, he may fulfill the obligation with his wife’s lighting. S”A 263:6 codifies this as halacha. Based on S”A 263:6-7, Bei’ur Halacha s.v. Bachurim maintains that there are two factors that obligate one to light Shabbat candles: 1) a personal obligation and 2) an obligation to arrange that there is light in the room one is staying so that people don’t trip and fall. The Bei’ur Halacha explains that a man fulfills his personal obligation with his wife’s lighting even if he is away for Shabbat. If he is staying in his own room, he nonetheless is obligated to light with a bracha because of the second obligation. Shemirat Shabbat KeHilchata 45:3 writes that just like husband fulfills his personal obligation via his wife, so too children who are “dependent on their parents” fulfill their obligation through their mother’s lighting. Rav Mordechai Willig (“The Positive Mitzvos of Shabbos,” min 39-43; quoted in Halachipedia Article 5773 #4) holds that an unmarried yeshiva student is considered dependent on his parents. Therefore, he fulfills his personal obligation with his mother’s lighting. In regards to the second obligation, if one doesn’t have a positive desire to have a light on in his room he need not light. Ohr Letzion (vol 2, p 165) agrees that one fulfills his primary obligation with his parents, and he adds that the second obligation can be fulfilled by having light from the hallway or street shine into his room. However, Shemirat Shabbat KeHilchata 45:11 argues that a yeshiva student is not considered dependent on his parents and doesn’t fulfill his obligation with his mother’s lighting. Shemirat Shabbat KeHilchata 45:11 writes that yeshiva students are considered one large family. Accordingly, one student should light in the cafeteria and thereby exempt the rest of the students from their personal obligation. Additionally, each student should make sure to have a light on in his room and, if necessary, should specifically turn on a light there without a bracha, relying on the bracha made in the cafeteria. He concludes, though, that if a student wants to light in his room with a bracha, he may do so, because essentially each student lives in his personal room and not the cafeteria. Teshuvot Vehanhagot 2:157 and Rav Chaim Pinchas Sheinberg (quoted by The Radiance of Shabbos p. 9) agree with the Shemirat Shabbat KeHilchata’s first approach that one student should light in the cafeteria and the others should light in their rooms without a bracha. Rav Hershel Schachter (quoted in Halachipedia Article 5773 #4) holds that students should light in their rooms with a bracha. He explains that they cannot light in the cafeteria because it is a public area, whereas the dorm rooms are private. Additionally, Rav Schachter argues, one does not fulfill his personal obligation with his parents unless he is going to be home for Shabbat. Az Nidbru 5:2, Shevet Halevi 1:52, and Chazon Ovadyah (Shabbat vol 1, p. 202) agree. ↑ Piskei Teshuvot 263:11 writes that if the student isn't eating in the cafeteria but is eating in someone's house, seemingly one can't fulfill one's obligation with the candles lit in the cafeteria. Nonetheless, concludes the Piskei Teshuvot, that there's what to rely on the Shulchan Aruch HaRav who holds that by eating at someone's house one becomes like a family member. See the Radiance of Shabbat (pg 10; by Rabbi Simcha Bunim Cohen) who quotes Rabbi Pinchas Shienberg and Rav Moshe Feinstein who are lenient. ↑ Yalkut Yosef (Shabbat v. 2, 263:17). Rav Yitzchak Yosef (Motzei Shabbat Vayigash 5779 min 38) explained that ideally they should light candles in the room in a safe place. But if there isn't a safe way to light or the administration doesn't let that it is forbidden to light in the room. Rather one should light with electric light and recite a bracha. They should have one person per room light. ↑ Mishna Brurah 261:23 writes that one should stop doing melacha a half hour or at least 20 minutes before Melacha. Shemirat Shabbat KeHilchata 43:11 writes that this amount of time is when one should light candles. See Shemirat Shabbat KeHilchata (43 note 57) where he discusses the minhag in Yerushalim to light 40 minutes before Shekiyah. ↑ How early can one light Shabbat candles? 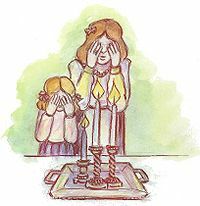 The Rosh (Brachot 4:6) writes that the earliest time to light Shabbat candles is Plag Mincha (ten and three quarter hours). The Tur 267:2 writes that this is also the opinion of Tosfot and the Bet Yosef 263:4 writes that this is the opinion of the Rabbenu Yonah and Mordechai. Shulchan Aruch 263:4 rules that one should make sure to light close to Shabbat so that it's recognizable that one is lighting for Kavod Shabbat, however, if one accepts Shabbat early one may light as early as Plag HaMincha. ↑ Menuchat Ahava (vol 1 4:3) writes that the electric candles aren’t worse than wax candles. ↑ Shulchan Aruch 264:6 writes that olive oil is preferable to other oils and Mishna Brurah 264:23 adds that wax candles are inferior to oil candles. This is also the opinion of Shemirat Shabbat KeHilchata 43:4 and Yalkut Yosef (Shabbat vol 1 pg 187). This page was last edited on 5 February 2019, at 00:36.